Wow, we had a fun and exhausting week! I had hoped to cover two continents this week, but we took it at a pace the boys set and enjoyed our week in Europe. To see more about the Mama Pajama School World Tour, check out this intro post. First, let me point out that my boys are ages 4 and 6 and we aren't attempting to cover every country. We are choosing countries based on activities that go along with that culture that I think they will enjoy. We "visited" these countries over the course of a week, interspersed with various other things going on in our lives. Some days we spent a lot of time on this, others hardly any at all. There is a lot in this post, sorry! Before we go over the different countries we "visited," I'll tell you a little bit about what is in our continent box for Europe. As shown above we printed a map from here, and gathered up some postcards and coins. The flash cards are from the Target dollar spot. The little landmarks are from this set (get it at Michael's with a 40% off coupon) and the 3D cityscapes are from this series. We also reserved a few books at our local library to fill the gaps in our family book collection. We point the country out on the map and globe to start, talk about what language they speak there and what the weather might be like there today. If there are stories in A Life like Mine that correspond with the country we read that, likewise for fun facts on our Picture Atlas. Our journey started in the Netherlands where we made pannekoeken for lunch. 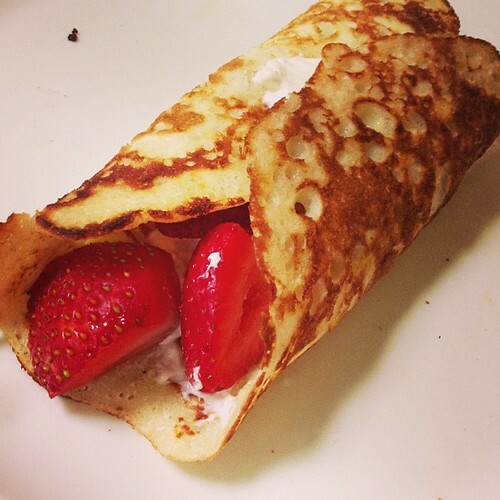 We rolled ours up with cream cheese and strawberries. Yum, yum! While we waited for the dough to rise, we watched this video about windmills and read The Boy Who Held Back the Sea and looked through an old book of Van Gogh's paintings I had. 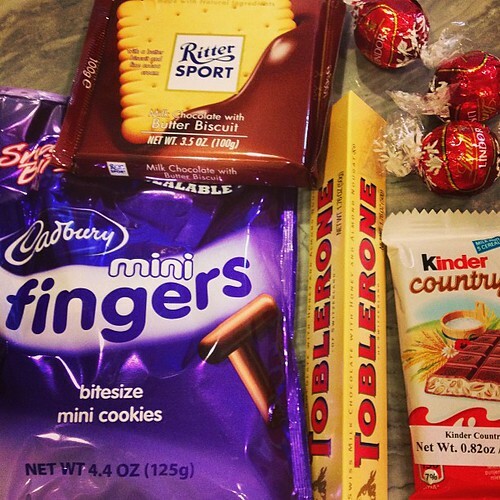 Since I wanted to keep the boys interested, we had a chocolate tasting party to introduce the next two countries, Switzerland and Germany. Obviously, this was a big hit! I didn't have many ideas for these countries, so we watched a video about the alps and a Bavarian castle. Beautiful Spain was our next destination. The boys enjoyed reading an old favorite, Ferdinand the Bull and then watching some videos of bullfighting and flamenco dancers on youtube. We talked about paella and saffron (they were amazed at how expensive my little jar with a few threads is) so we talked about how trade routes work, which led to a discussion about Columbus and his attempt to find a shorter route to the East. 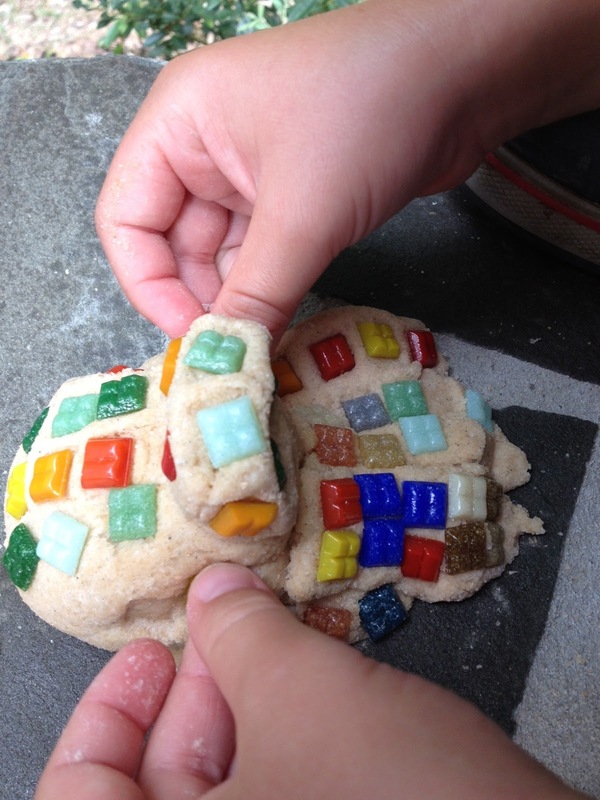 We looked at pictures of the architectural wonders of Gaudi and made our own mosaics, which I will share with you in more detail Wednesday as part of the Backyard Art Camp series. Our next stop was France for a little tour of Paris. They loved the little fold out cityscape book shown above and had fun looking at pictures from when Andrew and I visited back when I was pregnant with Jack. 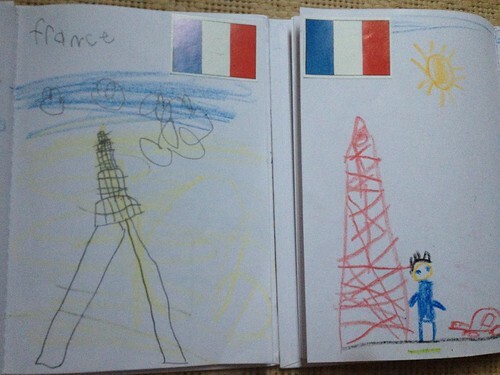 He was pretty excited that he already been to Paris. We bought some french cheeses at Trader Joe's and had a cheese tasting. They liked this video showcasing the City of Lights and were very excited to have Family Movie Night feature Ratatouille. 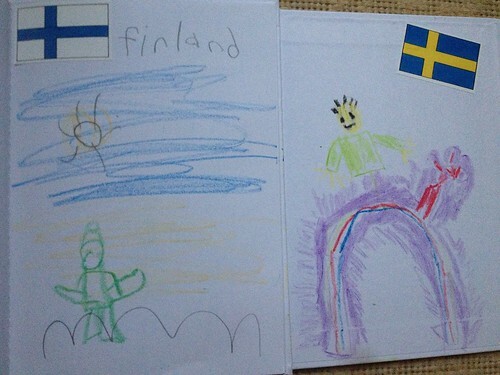 The next day we were excited to explore Scandinavia, or as these guys think of it, the land of Jan Brett books. We discovered Finland with this lovely story and super delicious custardy mac and cheese recipe. That recipe is going into the rotation and was a big hit with the kids and parents! Sweden is more familiar to me as I have traveled there, so we got out more travel & souvenir books and watched more videos. They loved seeing how the iconic Dala horses are made. They also enjoyed hearing about the warship Vasa (which I had pictures of from my visit). We went farther back in history to the Vikings, and, of course, we had to get Thor in, too for Norway. The United Kingdom was next on our tour. Despite my Irish heritage I didn't really come up with a good idea of an Irish activity (next summer! ), so we spent the bulk of the time in London. We already had an amazing pop up book, when we learned about London last summer during the Olympics and we had fun with this. Double Decker buses, Peter Pan, Mary Poppins, what's not to love? Our big event for the UK day was a tea party. 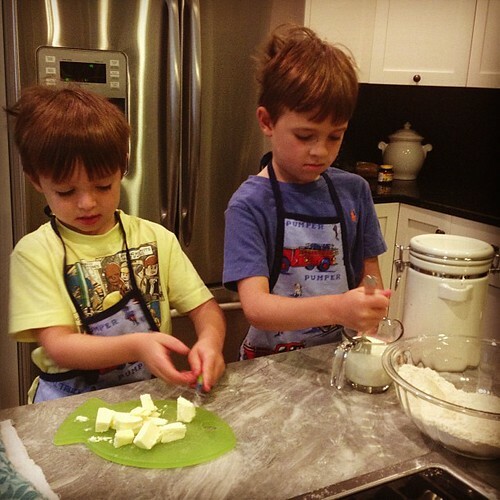 The boys made scones in preparation of Grandma coming over. We had fun decorating our table with British memorabilia. Grandma brought over some books and souvenirs from her trip to Scotland. The boys tried some Earl Grey, but weren't too impressed. We finished our European Week in Russia, which is appropriate as it straddles two continents and we are headed to Asia next week! My husband's family has Russian heritage so we talked about this and enjoyed the story The Keeping Quilt. 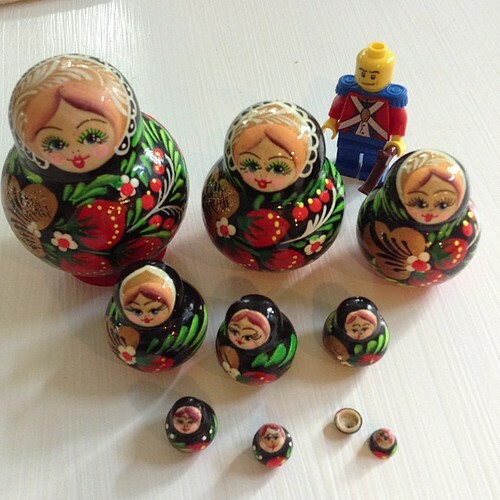 Of course we got out all of the nesting dolls. 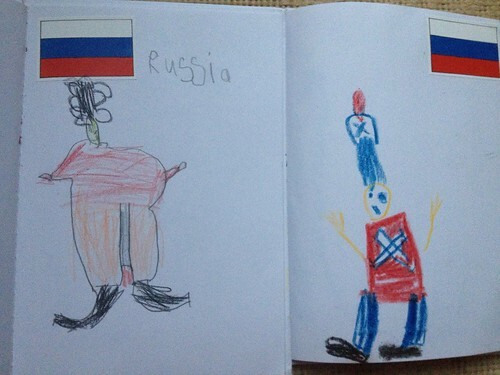 The boys really enjoyed watching cossack dancers and drawing onion domed towers like St. Basil's. Wow, what a week! It certainly kept us excited and with plenty to do, I just hope I have the energy to keep it up for two more weeks! Also, lots of countries left to cover next summer! I can't believe we didn't get to Greece or Rome (I have a BA in Roman History, for goodness sake - this could have been my first shot at actually using it!). Wow - what an exciting week! Love all your ideas, and the tea party. Maybe for Ireland next year you could burn some Irish Peat and watch "The Secret of Roan Inish" - one of our favorite movies.